Last week, Saturday. 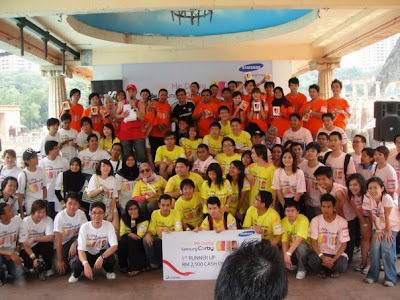 Me and nearly 100-odd blogger woke up on wee morning *feeling very sleepy that day* to attend Samsung Corby Day Event at Extreme Park, Sunway Lagoon . 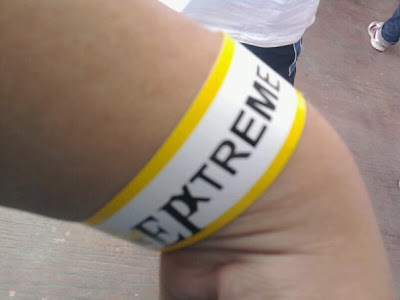 For event that lasted nearly 6 hour and 30 minutes. It kinda adrenaline rousing for many of us since the 4 of the activity's required speed, agility, pure brute strength and bit of planning plus tiny wee strategy.I was random selected into White Group *I think*. 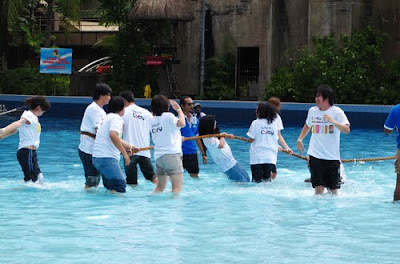 Yea kinda fun and exciting coz for some Nuffnang blogger , it's the first time they meet offline and in person while for other it kinda big giant gathering for blogger to hang up and some fun. With a quick breakfast (Sandwich+ Can Drink) and briefing by the emcee. 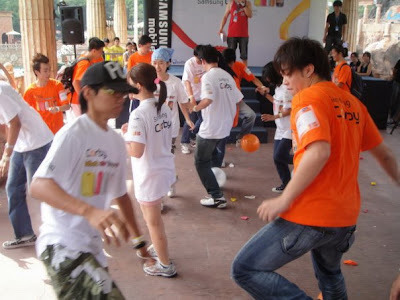 We quickly whiz off to our respective team (Pink, White, Yellow , Orange) before we are off with the 1st event. Balloon Stomping thingy. Refer to my Samsung preview post coz I attached my 1st video on the event . Forget to bring my swimming trunk so i make due with wet jean instead. 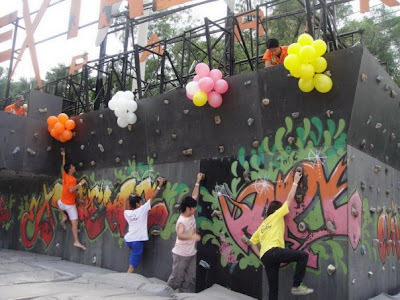 The 3rd activities that Samsung in store for us is the wall climbing event with ultimate goal to collect balloon at the top *one at the time*.The result was quiet hilarious coz in the end, the organizer restart the event again coz of *technical mistake*. This time a new ad hoc rules is created where one by one of us need to tap the top of the wall to earn single point resulting of some grunt from the crowd below. 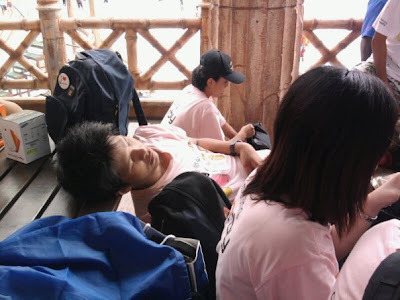 Despite bit tired, we threw everything we have although fail to win the event in the end. As for the 4 match aka paintball event, each team need to sent in 2 team consisting of 5 person for each team. Well, let say my teammates got blasted out by the opponent team of the event but most important no of them is injured like kellaw here. Sunway management should improve the paintball games in term safety coz their protection gear is wee insufficient to cover entire body and limited space mean player could not dodge for safety from incoming projectiles. 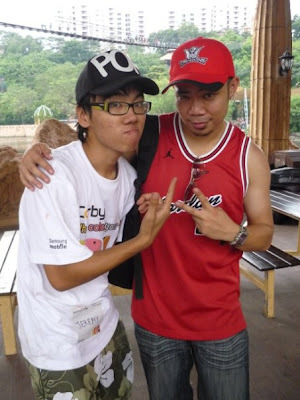 During the paintball event, me and some new blogger during the event decided to maximize our time by playing on the Javelin, Flying Fox, Archery, ATV trail and just plain exploring the Sunway Xtreme Park before organizer deciding the Orange team as the winner of the paintball match. Back on starting point, we chat, sat and munch away our hunger pang with losta food,drink and ice cool cendol while waiting for the final result. 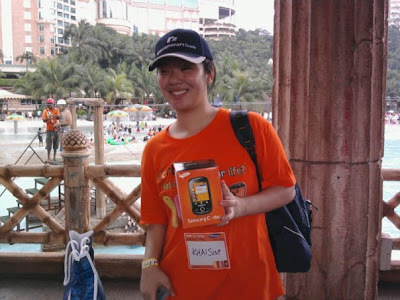 The 1st place , Orange team ( mean free Samsung Corby for entire team . 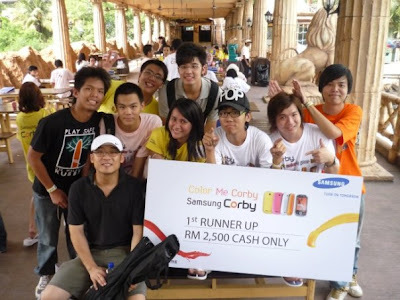 2nd place, Yellow team RM 2,500. 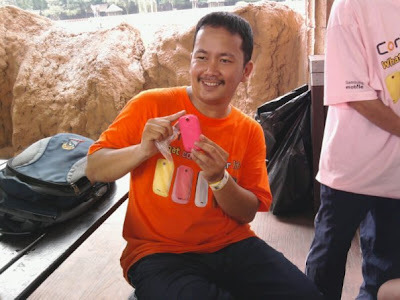 Here is some my photo taken with my handphone mix with other photo taken from the blogger before ending the event with group photo session. 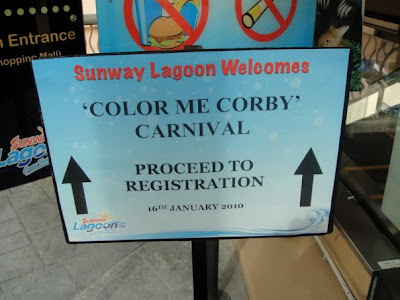 The only cons i quite think off is the event kinda short , safety issues and the changing ad hoc rules during event making "Fair Play" quite hard. I seriously hope Samsung + nuffnang could work together and improved this sort of event if they plan of organizing the same thing in the near future.